Welcome to Day 3 of “Dollar Store Pumpkin Makeover” Week! We are just hitting our stride. Today I thought I would jump a little ahead and share a Halloween style pumpkin makeover: A creepy crawly bug-infested spider pumpkin! I recently shared this hilarious wreath I found on the Better Homes and Gardens Facebook page.. and I really wanted to copy it. 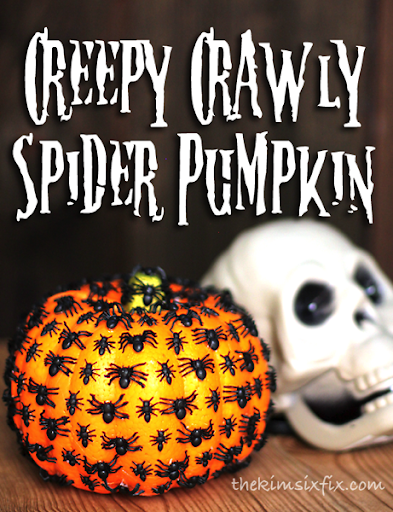 This version is super easy.. and you can find everything you need at the dollar store.. A foam pumpkin and a couple packs of fake bugs. Again.. Just like the wood slice pumpkin, the ‘tutorial’ is pretty self explanatory. Take bug... Add glue to pumpkin… Stick bug in glue… Repeat. One pumpkin took 2 full bags of bugs (i used one bag of spiders and one bag of ants.) To get more coverage, like the ants on the wreath, you would need more than 2 packages. I didn’t modify the pumpkin in any way, but you could paint it if you wanted it to be a more realistic color. I liked the bright orange contrast with the jet black ants and spiders. I sorta like the pattern (I alternated ant-spider-ant-spider as I wrapped around the pumpkin) and from a distance you can’t tell they are bugs. The surprise comes when you look really closely. ...yet it is funny at the same time.. Weird how that works. Don’t forget to come back tomorrow for Day 4’s dollar store pumpkin makeover! It is Flashback Friday, so it will be a blast from the past!